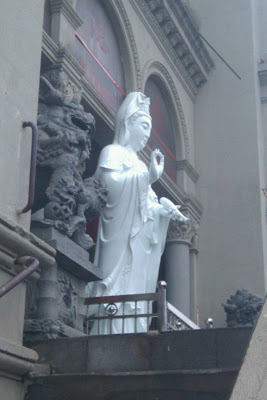 I went to Chinatown to help a friend look for a Kuan Yin. We found quite a few from $300 to $25, but she didn't find any she liked. I found a few stores I might like to look in when I'm looking for my next rupa. Rupa means form, and that is what they call a statue. So we went rupa hunting. We saw a lot of Buddhist organizations, at least 4. None seem to be inviting when I looked in, they felt ethnic, they had signs that I could not read. I love my order, but after that the most welcoming place I've been to is the Ch'an Center in Elmhurst Queens.